I asked Arnie Fenner if he could tease us with a few pages from the upcoming John Jude Palencar book, Origins. 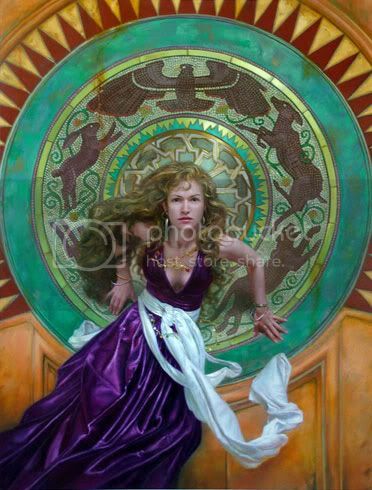 (I'm proud to see that it’s sporting artwork commissioned for a Charles de Lint Tor cover....particularly one that I never thought I’d get approved!) I believe it will release in late November. John is one of our masters in the field. He has a truly unique voice that can be haunting, ethereal, sensual, and disturbing...often at the same time. I know he is one of our in-house favorites. Whenever a new Palencar painting comes in everyone wants to get a look.He’ll be the guest of honor at the upcoming World Fantasy Convention. I’m looking forward to that trip for a number of reasons, not least of all for the opportunity to see more of his work in the flesh. Drizzt and Gwynn, a cover for the compended issues of the Legends of Drizzt comic book. Or the cover for Midnight Tides [seen above] by Steven Erikson, from Tor Books. Can't make up my mind. Coming up in September: Bullseye Tattoo is paying me to paint them a poster of anything I want. Paying me? To paint anything I want? That's a dream job. Your first break in the business? Designing the Dragons for 3rd Edition D&D! This is a crappy cell phone picture of a great David Grove drawing. But, that's OK since I’ve already posted it here. 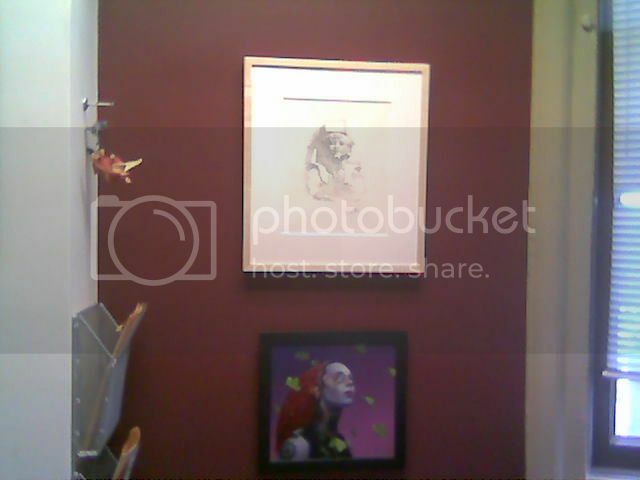 The difference in this picture is that the drawing is framed and on my wall. My good friend, Gregory Manchess, conspired and traded with Grove in order to give me this drawing. It's just now back from the framer and I can't tell you how happy it makes me each time I pass by. 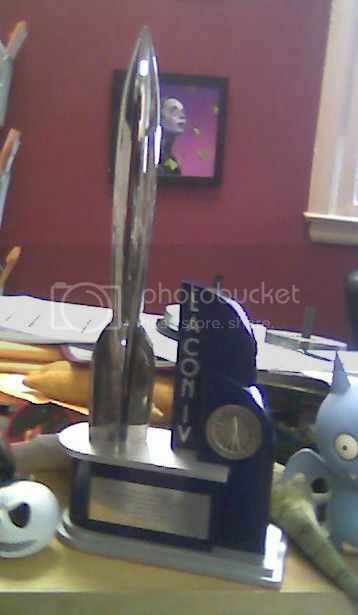 for winning this year's Hugo Award for Best Professional Artist! Donato is one of the best and most influential artists to have entered the field in the last fifteen years. He attacks each and every assignment to the fullest of his capabilities, often working much harder than the commissioned project requires. Right from the beginning of his career he was pushing his own abilities and pushing the standards of the field along with him. He never shies away from unusual perspectives, multiple characters, or potentially difficult problems to solve. I remember him calling me a few years ago and asking if it was okay to paint one of our covers all in white just to set up a new challenge for himself. He did and its a beautiful painting. Not only are his artistic abilities unquestionable, he is always open to share is approach and help others. For as long as I've known him, he has given many helpful demos and slide lectures -- often focusing, not just on his own artwork but, on his methods and people that influence him. And trust me when I say he's been a remarkable influence on the field. I get tons of samples from young artists every day. It is clear that most of the new generation of artists are studying his work and are struggling to make it part of their own language. I've often said that the best part of my job is getting to work with the people involved. Over the years, Donato has become a good friend. It was a great professional and personal joy for me to hear his name called out as the winner. Normally I take a more neutral stance on these things since I tend to work with many of the nominees. This years list was strong, all of them deserving...but some have won it many times in the past while others are still fairly new to the field. I was thrilled to see John Picacio and Stephan Martiniere on the list of nominees -- I belive that their time will come soon. But for this year, this award for Donato was long overdue and well deserved! Congrats, again, Donato! Donato's Hugo on my messy desk! I had the great honor to accept it for him, more on that once I can get down a few words about the convention as a whole. It is late but I want to mention the Chesley Awards tonight. It was a great honor to be involved. I suspect the entire event happens because a few dedicated volunteers do a ton of work. We all thank you for making sure that the contributions of the field's artists is honored. It is too late for me to create links to all the winning works but you would do better to go to the ASFA site and browse all of the nominated works. Congratulations to all of you and to all the nominees. I was a presenter for the hardcover award - I’ll post my intro here since I feel it applies to everyone. It’s the job of the Illustrator to meet all of the concerns and needs of the art director, sales and marketing departments, editors, authors, publicity departments, booksellers, and book buyers. To be able to do that at all is an accomplishment. To be able to do that and create art...that is remarkable. I am honored to read this list of nominees who have all created such wonderful artwork while jumping through a ring of fire. Here is the last of my vacation posts. I’m afraid that not having reliable internet access for a week has put me behind schedule. While I post this I am actually at the World Science Fiction Convention (more on that latter) but I did write it on a wonderful breezy afternoon...far away from wireless connections. As I write this, I am sitting on a park bench in the shadow of Norman Rockwell’s studio. A friend of mine, Gregory Manchess, has been teaching a class at the Rockwell Museum all week. I’ve been to the museum a number of times and it is always a thrill to see. Like the Brandywine, it has a very human scale...it’s easy to spend hours and see the entire exhibit without feeling overwhelmed. The work is, of course, wonderful. Thankfully, it is no longer trendy to consider Rockwell trite. I can’t imagine looking at the hope, concern, relief, and yearning for goodness that Rockwell so poignantly portrays into his pictures without being deeply touched. His depictions of life’s passages, whether it be from pre-pubescence into quickly oncoming adulthood or veteran that has returned home from war, are always hopeful but they are never trite. One of the interesting things about spending so much time here (besides the work) is eavesdropping -- I keep hearing people talk about their parents’ experiences with Rockwell, or their own experiences knowing or modeling for him. Today I heard a woman complain that he never paid his phone bill on time. I also saw an African-American man explain to a small girl that his famil members, being only one of two African-American families in the area, were used as the models on the civil rights themed paintings Rockwell did. It’s sad to realize that these first-hand accounts will soon be gone. I was also able to see the exhibit on the “fake” Rockwell. If you haven't heard the story of the forgery, click here. 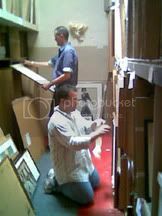 Interestingly, I heard from one of the museum curators that the forgery was nearly taken off the walls just a week or so before the original was found -- there was just too much evidence mounting against it. When compared to the original, the forgery does pale...but I have to admit that I loved this painting on earlier visits. Thanks again, Teresa and Scott, it was a highlight of our trip! Tiffany Prothero and Dan Dos Santos looking at proofs of Jon Foster’s upcoming art book. Melissa Ferreira, Jon Foster, and Dave Seeley looking at Greg Manchess’ paintings. Tiffany and Christina Dos Santos looking at Scott Fischer’s Peter Pan drawings. Get more than three artists in one room, then someone is bound to pick up a brush. Here is the impromptu collaboration of: Cyril Van Der Hagen, Scott Fischer, Greg Manchess, Jon Foster, and Dan Dos Santos. AKA: Scott Van Foschessantos. I think, to some extent, we currently get blamed for sins of the past. I know that “back in the day” it was fairly standard practice to place any painting on a book cover but that rarely happens at this point. What we do, occasionally, have is lack of information at the time that you need it. As the big bookstore chains asked for sales material earlier and earlier, we were required to start creating the covers earlier and earlier. At this point, I need to be working on a title at least a year in advance of the publication date. Still, most of the time we do have the manuscript, or a least a first draft that we can use. While most artists do read them, I cannot. Too many books need to be worked on at the same time to meet a catalog due date. I rely on the editors to give me a detailed synopsis and descriptions. We have a form that I ask them to fill out that describes the book, the characters, the plot, the tone. We don’t always want the jackets to be literal scenes from the book (what I call “chapter and verse” covers) sometimes we want more of a “mood” cover or a cover that evokes the story rather than gives an specific example from it. Which approach we take for a particular book is usually decided on in a fuzzy equation between the editor, myself, and how the Sales and Marketing departments want to position the book. In either case, these forms offer a springboard that lets me begin to think about the book and ask the editors more in-depth questions as I go. Our main objective, of course, is to sell books. An author’s fan base will already buy the book. We need to catch the eye of a casual browser and turn them into a reader. That only gives us a few seconds to make a big impression. My goal is to do that without going so far as to contradict the book. In other words, reading between the lines should be fair game. For the most part, people understand and welcome that interpretation, there is, however, a segment of the sf/f community that does ask for one hundred percent fidelity to the text. We once had a cityscape on a cover. The editor and author loved the artwork....but the fact that one stairway in the art was not described in the book kept eating away at the editor. In the end, he had the author write it into the book. This was inexplicable to me. I don’t imagine that the book described every brick and window that the artwork showed, but, that staircase had to have some textual origin for him. I don’t require that an artist read the manuscript. Remember, they are often juggling many projects at once -- an author may work on one novel and a few short stories throughout a year, an illustrator will often work on a few hundred covers, gaming cards, and various other projects in that same time. Still, many artists will read, or at least skim, the books. Even so, you’d be amazed how different people perceive the same words. On a number of occasions I've had the author, editor, and artist all have three very different ideas on what something/someone looked like. You'd think the author is the authority, except, if the other two readers both have completely different ideas, than clearly there is a discrepancy between what the author has written and what others are perceiving...Given ten readers, you may well end up with ten different interpretations on what a character looks like. If those readers were intrigued enough to pick up and buy the book, then the first and most important part of our job is done. We went to the Boston Public Library to see a series of John Singer Sargent murals. We quickly forgot all about Sargent when we unexpectedly ran into these murals by Edwin Austin Abbey, Quest for the Holy Grail. These were just spectacular! It was a sunny day so the longer we stayed the more we saw the sun make different panels jump alive. Unfortunately I didn’t bring my binoculars to get a closer look. We were about to run to the hotel and get them but the library was closing. I plan to make this my first stop on my next trip up here, whenever that may be. Anyone going to Boston with an interest in painting, illustration, or fantasy must see these. The Sargent murals were fantastic as well, although it was hard to settle into them after being so surprised about the Abbeys. Unfortunately I did not get any shots since my camera batteries ran out, however, here is the Boston Public Library’s guide. The library also had an exhibit of Stow Wengenroth. He was a lithographer that made prints of New England scenes. I had never heard of him -- these were equally as surprising and wonderful to discover as the the Abbey’s, albeit in a more introspective way. I loved the simplicity in the shapes and the otherworldliness that so many subtle values of gray gave. It is easy to imagine that he is a real inspiration to Chris Van Alsburg. (As an aside, for an essay on how colorful b&w drawings can be, see David Apatoff’s “How Many Lines Does it Take to Draw a Blue Sky?”) The library also had an exhibit of Joan of Arc artifacts. It seemed to have a lot of kitschy memorabilia so, pressed for time, I didn’t delve into it too deeply....still,I loved how simple and free this little “tobacco card” drawing was. We went to the Isabella Stewart Gardner Museum. This is the mansion home of Mrs. Gardner and her art collection. It has been maintain as a museum exactly the way she left it when she died in 1924. Although the art was stunning, I thought it was more interesting as an environment than for the artwork in particular...Although, this Sargent painting was clearly worth the admission all on it’s own. The New England Aquarium is well worth going to....but then, I think most any aquarium is well worth going to. The Old North Church. I am not at all religious but it was, nonetheless, pretty great to come across this while mass was in session and the congregation was singing. And then it was on to the Battle Road in Lexington and Concord. I’m ashamed to admit just how much history I learned on this trip, especially from this Minute Man. Where was he when I was in high school history class! We saw a number of these docents...some a little hokey, yes, but most all of them were so heartfelt that it was hard not to get appropriately choked up by their sentiments. Currently....I am in the Berkshires where I don’t plan to see much of anything for a few days besides rolling hills and cardinals. I'll be on vacation starting in, oh, about an hour. I'm hoping to keep posting but I'm not entirely sure that I will have internet access past Sunday. A number of you have asked me to write about the process of coming to the final jacket - I hope to tackle that and other issues next week. As an aside: I apologize that the images don't "click for larger view". I just realized what I need to do to make that happen. In the future, I'll work that out. At Comic Con, Charles Vess showed me a sneak preview of new paintings that he and Michael Kaluta collaborated on for Fables: 1001 Nights of Snowfall, due from DC Comics/Vertigo in October. I love both Charles’ and Michael’s work...seeing these collaborations was twice the pleasure. While the work was certainly recognizable as their’s, it still, somehow, felt like discovering a new, great artist. This will be one sweet book. About two years ago I was approached to draw the art for the framing sequences of the graphic novel which will consist of a number of individual stories all written by Bill Willingham and painted by various artists. As the deadline moved closer I realized that I would be unable to meet it without some assistance so I turned to long time friend and art buddy Michael Kaluta to help out. Kaluta has drawn some spectacular art set in the world of the Arabian Nights before and I also knew that we were both on the same wave length when it comes to how we 'think' illustration. I blessed my lucky stars as his drawing came in. Who wouldn't be excited by those images. It was quite easy to ink and paint over whatever his Rococo imagination had envisioned. It was so much fun that I kinda didn't want it to end but deadlines are deadlines. In this particular instance I had already drawn a crude sketch (image #1 below) of the image that Michael then refined and brought to life (image #2 below). I would then take his penciled page and ink over the lines with a black/brown mixture of FW ink (image #3 below), leaving off outlines that I thought needed to be more subtle (the princesses suitor, etc.). Over those inked outlines I layered a solution of the FW inks and water by first soaking the image with a yellow/orange mixture, applied with a sponge to give it that Middle Eastern glow. Then I applied multiple layers of various colors to add depth and individual details (image above). Unfortunately a number of my co-workers read this blog...that means they’ll know when I play hooky. I took today off and spent it going through the permanent collection at the Society of Illustrators. Cleaning house a bit -- deaccessing a few works that we no longer feel fit the collection’s needs, placing aside items that can use a new frame or a good cleaning, and just being sure that everything is where we think it is. What a treat to be able to spend the day so intimately involved with J. C. Leyendecker, Howard Pyle, Robert McGinnis, Joseph Clement Cole, Leo and Diane Dillon, Vin Di Fate, John Berkey, and the like! As much as possible, I would take a minute to enjoy the work, but, there was something equally exciting about simply working with all those amazing paintings. “Pass me that Cornwell.” “Sure...wait, I just have to move this McGinnis first”....I mean, that’s just cool! 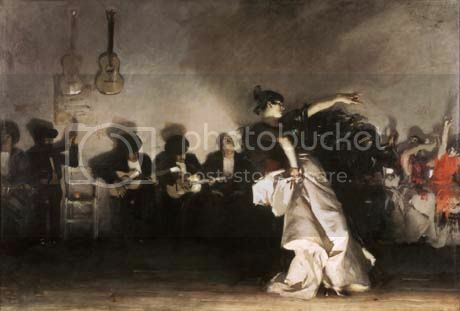 The Society owns about 2000 paintings and drawings. They put together a number of permanent collection shows each year. Some are exhibited in their galleries in New York, others travel around the country to various galleries and schools. Someday I’d like to curate an “adventure” exhibit from the collection -- there are so many great narrative paintings of pirates, shipwrecks, horse chases, and all kinds of swashbuckling antics. It’s still in the daydream phase...but it wouldn’t be too hard to make it happen. Towards the end of the day, we came across a stack of WWI posters. The art was amazing but what really floored me was the printing. These things are nearly 100 years old and the color is as vibrant as an original painting done today. Sadly, all I had was my cell phone camera with me to take these shots. Vincent Di Fate’ s accomplishments are too many and too varied to be listed here -- he is, remarkably, equally gifted as an artist, teacher, and historian. For a full and fascinating biography, you should visit his website. If you have any interest in science fiction art and do not own is art book, The Science Fiction Art of Vincent Di Fate, and his survey of science fiction artists, Infinite Worlds, than you are better off leaving right now to obtain them. What is your favorite painting in the last year? Almost anything by Justin Sweet. This is one truly fabulous talent, from what I've seen so far. 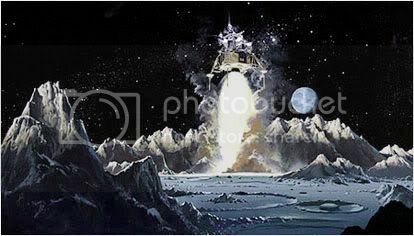 Some years ago (late '70s, early '80s) I got the assignment to illustrate the covers for Signet's series of novels and story collections by Robert A. Heinlein. I grew up reading those books and loved the idea of creating new cover art for them. The series was acquired by some other softcover publisher before I got to the really great novels--The Puppet Masters, Double Star and The Door Into Summer. (2) assignments I wish I'd gotten, but nobody ever asked me. 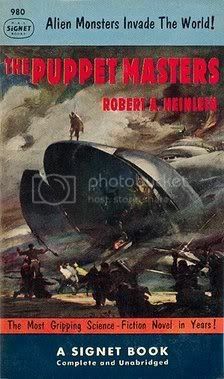 The answer to the first one is that I wish I could have painted Meltzoff's original cover art for The Puppet Masters--in my opinion, the genre's one true masterpiece. 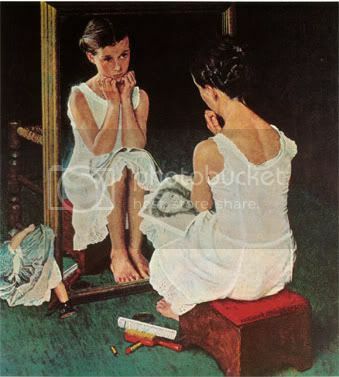 Of course, I was only seven in 1953 when it was done, but I couldn't paint something that good even now, at age sixty. My first break was also the first and only time I ever got fired. Nearly fresh out of art school, I was working for Krantz Films on the ABC-TV animated superhero series Spider-Man first as a background artist, then as an in-betweener (assistant animator). I'd been "kicked upstairs" when they learned I could draw and my job was mainly to take the animators' drawings, correct the anatomy, merge the styles into one consistent look, then do the in-betweens (the motion drawings between the specific start and stop positions). Long story short, the show was attacked in a brutalizing editorial in The New York Times that claimed we were scaring kids out of their toilet training because of the violence in our show. That editorial appeared on a Sunday. Monday morning most of the staff was let go, including me. That was a week or two before Thanksgiving, 1968. I was technically still in the Navy then (this was during the Vietnam era), but in late March my wife of about two weeks had been diagnosed with terminal cancer and given just three months to live. While I awaited formal discharge from military service on the grounds of humanitarian hardship, and my wife, Roseanne, somehow clung to life, I'd gotten the gig at Krantz Films. Steve Krantz, our producer, is married to best-selling author Judith Krantz, and has since written a few best-sellers of his own. Our director, Ralph Bakshi, has been variously described as a demon and a saint. I personally think demon is more apt. I could have begged for my job back and stuck it out for a few months if they'd have known about my personal situation, but it was a matter of pride with me. Spider-Man was not immediately cancelled; its funding was pared to the bone by ABC and the studio was allowed to finish out the season, provided that it "cleaned-up" the show. The upshot was that I figured I'd try my hand at freelance while I waited to find gainful employment elsewhere. I went up to Analog during the week between Christmas of 1968 and New Years, and walked away with two manuscripts under my arm from the legendary John W. Campbell, Jr. Campbell was the first editor to take my work seriously and to give me enough freelance to keep me busy. And that was the beginning. Campbell gave me 75 assignment in that first year, and I never looked back. The good news is that Ro's still alive after nearly 40 years and is in reasonably good health, under the circumstances. She had an advanced stage of Hodgkin's Disease, considered terminal then, and for seven long, grim years we lived life day-by-day. The other good news is that I was sucessful at illustration, though I seldom give myself the luxury ofappreciating my success. For me, my entire career has been a reaffirmation of my total lack of talent. Every painting is, in the end, a crushing let down. The career highlight is ongoing and it centers around the fact that few people have ever figured out how bad I truly am.